Where and how to store data. where to write logging data. Manual customization of this file is not recommended. This documentation describe how to set-up on a generic infrastructure an Orion Context Broker cluster in High Availability. The ideal solution for providing Active-Active access to the HA Proxy cluster (and consequently to the Context Broker) is the adoption of a DNS service that supports multiple IPs for a single name. This will allow clients to use a round-robin solution to pick the actual host to connect with, in case of failure, the second will be used and so on. The alternative is the usage of a VIP mechanism to provide Active-Passive access to the HA Proxy cluster. In this case, the active instance of HA proxy will be only one, in case of a failure of the active HA Proxy, one of the other HA Proxy will take on the Virtual IP. The picture below present the network architecture of the deployed cluster. In the following we describe the different steps to configure such a cluster on a set of virtual machines. In docker related documentation, we shortly discuss how to create the same architecture leveraging on a Docker Swarm cluster. The configuration discussed below assume you have one server per each box represented in the architecture. Of course, different layers, e.g. 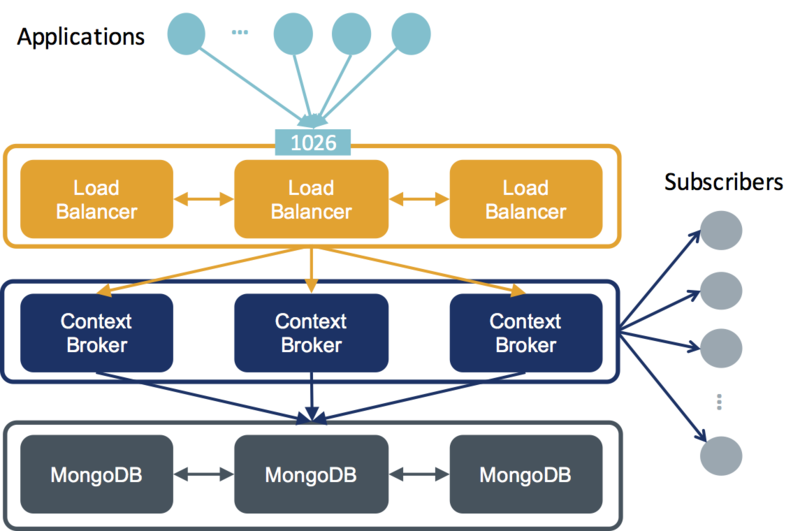 HA Proxy and Context Broker can be combined together on a single server. Requirements: * 3 VMs running Centos for the Context Broker layer. * 6 VMs running Ubuntu 16.04 LTS for the HA Proxy and MongoDB layers. Install MongoDB 3.2 using the following commands. WARNING: this test was done when Mongo DB 3.2 was supported in Orion, test should be redone with the current version.